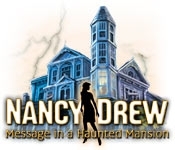 You, as Nancy Drew, are invited to assist in the renovation of a Victorian mansion in Nancy Drew(R): Message in a Haunted Mansion! According to legend, a fortune in long-lost gold is hidden somewhere on the property and someone is determined to find it. In a house full of trap doors and secret tunnels, breaking glass and suspicious fires, one misstep means Nancy won't stand a ghost of a chance! Find the treasure using your Hidden Object skills!